Tonight I was talking to a good friend who finally got an answer to a prayer she’d been praying for a long time: a new car. There were a few hiccups at the dealership, but, as of tomorrow she’ll have a new car. Turn off your brain, ma’am. 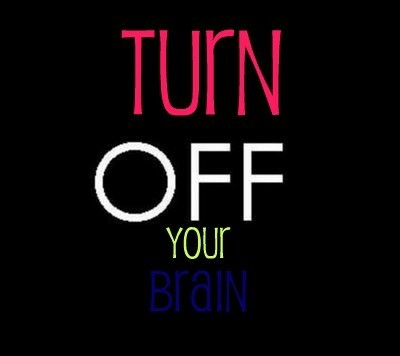 Sometimes, we need to turn our brains off, become brain-dead. When we being to think about what will happen after we get the blessing, we really don’t understand the full magnitude of being blessed by God in the first place. Everyone, women especially, become overly consumed with the how when that part of the equation isn’t our problem anyway. Just think about it: when Eve was brought to the Garden of Eden, everything was already prepared, ready for her arrival. She didn’t have to ask how the food grew on the tree, or how the plants were being watered. She didn’t have to ask why the animals stayed at bay and didn’t viciously attack them or what place was made for them to find shelter and the things they needed. Everything she needed was there. The only thing God asked her to do was be where she was supposed to be and remain obedient. When God blesses you with something, the how is NOT your problem. It’s His. We analyze, over think, plan out so many things unnecessarily that we bring stress, heart ache, depression, and a host of other nuisances because we think our MIND can work through a SPIRITUAL matter. Ladies and Gentlemen, it doesn’t quite work that way. So why do we spend so much time racking our brains trying to figure out what God has already prepared for us? All we need to do is be where we’re supposed to be and remain obedient. Why “childlike faith”? Because children, in their younger years, do not have the ability to analyze. Sit on that for a second. I’ll wait. Jesus asked for faith, belief, response to His Word like a child because their ability to analyze and over think things had not overtaken them…yet! Kid’s aren’t thinking about how they’re going to get fed, they just know that when they get home there’s food on the table! They’re not thinking about how brand new clothes show up in their closet, they just know they’re fashionably headed to school! Trust God. The “how” it will be done is NOT your problem, it’s His. When you finally understand THIS, you’ll never stress a day in your life again. Relax. When you’re a King’s kid, that’s how life is supposed to be. AMEN!!!!!!!!!!!!!!!!!!! Thank you, thank you thank you!! Your totally right!!! In the past I have found myself worrying about the how instead of just letting God do it. He always works it out anyways…I just think as humans we naturally want to know how because thats how ‘we’ make things work lol But only God will know the supernatural things I guess…So we just got to have faith in Him.